A growing concern for many cities is what to do with all of our electronic waste. This is no different here in Albany as many residents are replacing their old devices with newer models. This is especially true for televisions as folks make the switch over to HDTV. If you’ve ever gone to an electronics store and has seen the crystal-clear pictures provided by HDTV then you know what you’ve been missing. It’s hard to go back your old set after something like that! As a way of providing a method of getting rid of electronic waste the city of Albany has stepped up and provided a procedure to handle this type of disposal. Unfortunately, it might not be the most convenient of programs. 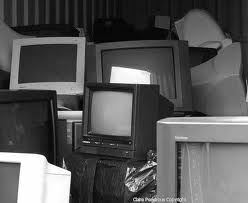 If you want to get rid of unwanted electronics like your television you can take them to the Department of General Services Monday through Friday from 7 AM to 5 PM and “deposit them in the convenient drop-off area located in the parking lot.” The other option would be bring those same electronic devices to the scheduled Household Hazardous Waste and Electronics drop-off events. These are scheduled throughout the year and you can check back to the city of Albany website to find out the dates. Although noble, what’s the common denominator with these programs? You have to do all the work. If you’re dropping off an old television that means you need to find someone to help you move it out of your house and load it into your car. That might work if you’ve got a friend with muscles and a big enough car otherwise you would be out of luck. The other problem is the restrictive nature of the times for the drop-off. If you work Monday through Friday it’s going to be hard to drop-off that old television during those work hours. You could try to squeeze in some time during your lunch break but then you would have an old TV sitting in your car that might prove to be too tempting a target. There is a better way. An alternative to you doing all the work is to hire a team of professional junk haulers like Junk King Capital District to come to your house and remove the old television. This means they’ll be working on your schedule. If a Saturday morning pickup works better for you then that’s when it can be scheduled for. They’ll also do all the heavy lifting. All you really need to do is unplug that old television set. Once these professional movers have loaded up your old television you can also get them to fill up their truck with any other junk you want to get rid of. You’re not going to be able to drop-off old furniture, an unused mattress or a refrigerator at the city’s drop-off center. But when you hire the professional haulers like Junk King’s team they’ll have no trouble filling up their truck with all your junk. That’s a much better use of your time and energy! This entry was posted in Albany Junk Hauling, Albany Junk Removal, Junk King Capital District and tagged Albany Junk Removal, Albany TV Disposal, capital district hauling, Junk King Capital District on April 30, 2012 by Todd Porter. Last updated August 1, 2017 . 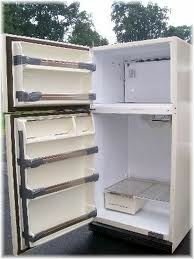 What is your old fridge worth? You might be thinking it’s time to replace that old clunker in your kitchen in favor of a newer model with more “bells and whistles.” Nothing wrong with that but as you go shopping for your new ice box you might want to investigate the “Buy Green, Save Green NY High-Efficiency Appliance Rebate Program.” That’s government speak for “you can get cash for your old fridge.” How much green? How does a $350 rebate on a refrigerator and $250 rebate on a washing machine sound? All of a sudden buying a new kitchen appliance is starting to make a lot more sense. This is all part of a $3.5 million federal program that recently began for New York residents. In order to receive your rebate the new piece of equipment you purchase has to meet standards for energy efficiency. These standards were developed by the Consortium for Energy Efficiency. “This rebate program gives residents the funding to make their homes more energy efficient, it makes it possible for New Yorkers to spend less on energy costs, and it provides a needed boost to retailers across the state,” Governor Cuomo said in a statement earlier this month. The other caveat is that when the funds run out the program will end. Within the first couple of days of the announcement of this rebate program $500,000 in rebates was scooped up by smart shoppers. You can still get in on this action but you’ll have to act fast. When you go shopping for a new fridge, you’ll want to start by looking for any model that has an Energy Star rating. This means the manufacturer has taken up the recommendations provided by the EPA as to what energy efficiency means. Basically, the new design of refrigerators lets you run that box for less energy. This means your electric bill should be reduced once you plug in your updated ice box. In most homes, the refrigerator is the single biggest user of electricity so it only stands to reason you should want to get a better bang for your buck in terms of energy use. Appliance retailers are already seeing a boom in business. Of course, buying a new refrigerator is only half the job. First, you have to get rid of your old model. This can be accomplished when you hire a team of professional junk haulers like Junk King Capital District. These same junk haulers can also make use of the refrigerator removal appointment to take away whatever other piles of junk you have. Make a clean sweep of your home and start saving money today! This entry was posted in Albany Junk Hauling, Albany Junk Removal, New York Refrigerator Disposal, Troy Junk Removal and tagged Albany Junk Hauling, Albany Junk Removal, Get Rid of Old Refrigerator, Junk King Capital District, New York Refrigerator Removal, NY Refrigerator Disposal on April 16, 2012 by Todd Porter. Last updated August 1, 2017 .